The third part in 'THE DIVERGENT' film series; and the first half of an adaptation on the third (and final) book 'Allegiant' (written by Veronica Roth). 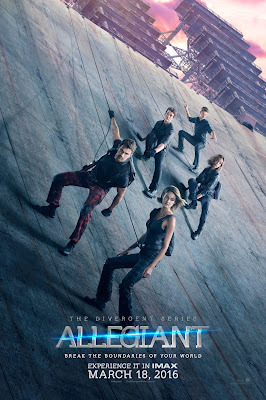 This movie has Tris and Four escaping through the wall, encircling the dystopian Chicago, and finding a new advanced society of people, that have been studying them for years. The film has Shailene Woodley, Theo James, Miles Teller, Ansel Elgort, Zoe Kravitz, Maggie Q, Jonny Weston, Ocatvia Spencer and Naomi Watts all reprising their roles (from earlier films); and Jeff Daniels joins the cast. It was directed by Robert Schwentke; and scripted by Bill Collage, Adam Cooper and Noah Oppenheim. I enjoyed it quite a bit. This chapter begins with Evelyn (Watts) taking control of Chicago; after murdering Jeanine (played by Kate Winslet, in the previous movies), at the end of the last installment. Her soldiers prevent everyone from leaving the city, and begin executing Jeanine's conspirators. Tris (Woodley) and Four (James) rescue Tris's brother, Caleb (Elgort), from being killed. They then decide to break through the wall, locking them in the city, and see what's beyond it. I was a big fan of the first 'DIVERGENT' movie, and really enjoyed the second film as well (although not quite as much). I think this installment is about as good as 'INSURGENT'. I'm not sure why the reviews are so harsh (or why the Box Office has dropped off, so much), but I really like it. It's a lot of fun, the visuals are spectacular, and the action scenes are awesome (they're actually an improvement over the previous chapters). Woodley, James and Watts all give great performances (once again), and the story is involving (and mostly fast-paced). I think fans of the series should be more than pleased.